Women’s Leadership Initiative -- On May 23rd, more than 150 women gathered in Bridgeport at the Black Rock Yacht Club to celebrate the 20th anniversary of Pullman & Comley’s Women’s Leadership Initiative, which for two decades has provided women professionals with the opportunity to network and learn from each other. This year’s event paid tribute to The Center for Family Justice, providing free and confidential services for all impacted by domestic violence, sexual assault and child abuse in six Fairfield County towns. P&C attorney Nancy Lapera, current chair of our Women’s Leadership Initiative, introduced our previous leaders, P&C attorneys Diane Whitney and Deborah Breck. Debbie addressed the crowd about the history of the Tea and how it has evolved over the years into a major professional women’s networking event that our guests look forward to each year. Deborah Greenwood, the Center for Family Justice’s president and CEO, spoke about the Center’s mission. (Pictured in above photo, from left to right: Nancy D. Lapera, Partner and Women's Leadership Initiative Chair, Pullman & Comley; Valerie Foster, Chair, Board of Directors, Center for Family Justice; Debra Greenwood, President/CEO, Center for Family Justice; Mary Ann Mencel, Executive Project Coordinator, Center for Family Justice; Angela Schlingheyde, Director of Civil Legal & Court Advocacy Services, Center for Family Justice; Deborah S. Breck, Partner, Pullman & Comley; Donna Milne, Board of Directors, Center for Family Justice). Lawyers Collaborative for Diversity – Pullman & Comley and the Lawyers Collaborative for Diversity (“LCD”) have had a strong partnership for many years. P&C Diversity Committee Chair Jessica Grossarth Kennedy serves on LCD’s Board of Directors and this spring P&C attorneys and LCD joined together on a number of initiatives. On April 5th, Pullman & Comley was pleased to host the fourth annual Fairfield County networking event for the Lawyers Collaborative for Diversity (“LCD”) in its Bridgeport offices. Nearly fifty outside guests attended, along with over thirty P&C attorneys and paralegals. LCD’s Executive Director Carolyn Golden-Hebsgaard explained the purpose and impact of LCD in this state and how its goals are advanced by the energy and vision of its member firms and organizations. P&C’s own John Stafstrom then shared his experiences as a gay man in the state’s legal and political communities and how he has made diversity a lifestyle, as opposed to a goal. The event was catered by Taco-Loco, a local minority-owned business. Later in the month on April 25th, P&C Diversity Committee Chair Jessica Grossarth Kennedy participated as a panelist for a LCD Diversity and Inclusion Best Practices Symposium that also featured LaTanya Langley, Vice President and General Counsel of BIC Worldwide; and Rich Wasserman a Partner with Day Pitney LLP. The purpose of the Symposium was to bring together LCD members and guests to discuss the challenges of diversity and inclusion in the legal profession and best practices in attracting, retaining and developing diverse talent. The panel kicked off with a presentation of the data that speaks to the current state of diversity in the legal profession, which set the stage for the panel discussion. The panel discussion topics touched on best practices around recruiting initiatives, associate development programs, measuring diversity success and looking beyond race and gender. LCD intends to continue the best practices symposiums going forward for its member organizations. In May P&C was a GOLD sponsor of the LCD’s Thirteenth Annual Edwin Archer Randolph Diversity Award ceremony held at the United Technologies Corporation’s Pratt & Whitney Hangar Museum in East Hartford. The awards were presented to the Honorable Angela C. Robinson and Attorney Sanford (“Sandy”) Cloud, Jr.. The Edwin Archer Randolph award is named after Edwin Archer Randolph, a Yale Law School graduate, who was the first lawyer of color admitted to the Connecticut Bar in 1880. In tribute to his legacy, the award honors an individual who promotes the inclusion and advancement of lawyers of color and other professionals. CBA’s Celebrating With the Stars -- On April 13, 2017, the Connecticut Bar Association (“CBA”) held its annual Celebrating With the Stars dinner during which it acknowledged the diversity and inclusion efforts of several individuals including Justice Robinson. Pullman & Comley was a sponsor of the event. CBA Diversity Committee – Pullman & Comley attorneys Jessica Grossarth Kennedy, Erick Russell and Bob Hinton are active members of the CBA Diversity Committee. The Committee focus is assisting with the implementation of the Summit pledge and creating other diversity based seminars for the CBA membership. Connecticut Bar Foundation -- On April 20, 2017, the Connecticut Bar Foundation (“CBF”) and the CBA hosted a Diversity Symposium at UCONN Law School. Pullman & Comley attorney Bob Hinton helped plan the Symposium, which was intended to continue the meaningful diversity and inclusion dialogue that was started at the CBA’s Inaugural Diversity Summit last year. The Symposium consisted of a half-day program and included presentations and panel discussions on such topics as implicit bias, diversity metrics and overcoming impediments to achieving meaningful diversity and inclusion in the legal profession. P&C was a GOLD sponsor of the event. Crawford Black Bar Association – P&C was a proud “Diamond” sponsor of the Crawford Black Bar Association’s 40th Annual Dinner held on May 4th. A number of P&C attorneys attended the event, including Erick Russell who was recently appointed Co-Chair of Crawford’s Political Awareness Subcommittee. Erick’s focus on that committee will be to supply the membership with information about how to get more involved in the political process, and to help to grow a stronger relationship between Crawford and elected officials in the State. 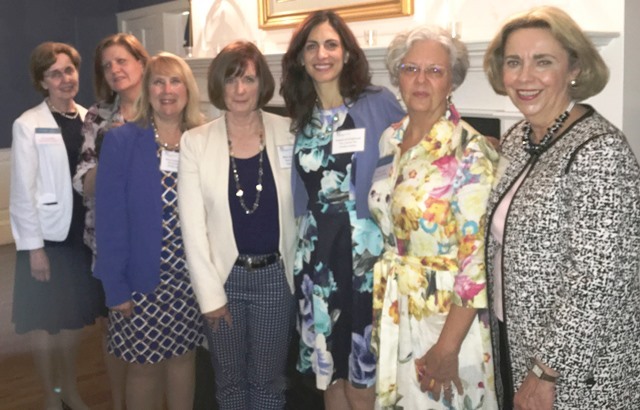 Connecticut Italian-American Bar Association – The Connecticut Italian-American Bar Association (“CIABA”) held its annual Festa della Primavera Dinner and featured Second Circuit Judge Reena Raggi as the event’s keynote speaker. P&C’s own Mike Ceccorulli is on the CIABA board of directors. Lambda Legal – On May 1st, Lambda Legal held its National Liberty Awards dinner and fundraiser at Chelsea Piers in New York City. Pullman & Comley attorney John Stafstrom serves on LAMBDA’s board of directors, is co-chair of the Development Committee of the board and was co-chair of the Liberty Awards event. The event honors LGBT advocates, activists and allies in the LGBT community’s fight for equality. Larry Kramer, a distinguished American playwright, author and LGBT rights activist, and Javier Muñoz, an openly gay, HIV-positive man, were both honored. A total of $1,020,000 was raised that evening. CBA LBGT Section – In the second quarter of the year our own Erick Russell assumed the role of Chair of the LGBT Section of the CBA. P&C attorney Jessica Grossarth Kennedy remains an Executive Committee member. Westfair Communications Diversity Event – In April, our own Jessica Grossarth Kennedy was named a diversity champion at a Westfair Communications Celebrating Diversity in Business event in Westchester, New York. Diversity 1L Program – The firm’s diversity and recruiting committee’s worked throughout the second quarter of 2017 to recruit and select the firm’s second annual 1L diversity summer associate, Andres Jimenez-Franck. Andres spent 5 weeks with P&C and will spend the rest of his summer working in the legal department of one of Connecticut’s largest hospitals. Supplier Diversity – In accordance with Pullman’s supplier diversity objectives, the firm recently switched shredding services companies to InfoShred, which is located in East Windsor and is a Connecticut Certified Minority/Woman-Owned Business.